They aren’t all hilarity-filled, some have a great deal of pathos and should make you stop and think – like this Foodbank themed one. It certainly feels apt as I look ahead to my shift at our Foodbank tomorrow morning, and continue to seethe at the way in which the government treated the debate on Foodbanks the other day. In preparation for the holiday season, I’m gathering together some festive films to watch en route to Ireland (hello four hour train journey & two hour ferry crossing). The Muppet Christmas Carol is a favourite and was actually shown the last time I caught a ferry for Christmas, but how many of these 14 facts about the film did you already know? Most fascinating for me was the way in which the Ghost of Christmas Past was created, via a submerged Muppet and a green screen. Oh, and it includes the video of the scene that was excluded from the theatrical release on the basis that it was too sad for children (phooey) – a move that caused consternation on the release of the DVD version as its VHS predecessor had included it. Those of us who made the technological transition mourn its loss on every viewing. Oh, and the list is correct, It Feels Like Christmas *is* one of the best Christmas songs ever. Get that soundtrack added to your Christmas playlist asap! I cannot get over the joy of hearing “They won’t be expecting that!” in a Kiwi accent! The morning of our service was the evening of their carol service, at which their 2013 video debuted. It’s a little different from previous ones, but worth a watch nonetheless. Finally, a piece of ridiculous seasonal music which manages to combine Christmas and musical theatre – Wicked, specifically. I give you Defying Gravity, as sung by Rudolph the Red-Nosed Reindeer. It’s a little niche, but it is possibly the best use I’ve seen of the Wicked Backing Tracks (I only my copy for moments when I like to prance around pretending that I am actually a West End star). So on Monday night I spent some time preparing the calendar for me and the Norwegians. (Amusingly, I was a day ahead of myself, thinking that it was the 1st yesterday and knowing that Tuesday was busy. Ho hum.) 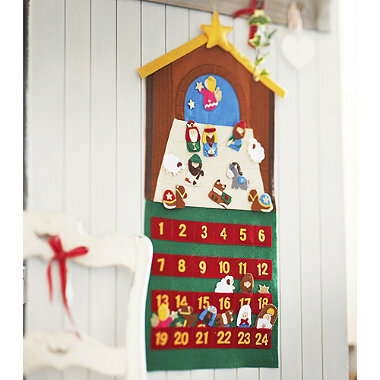 The basic premise is that there are 24 felt Nativity characters, with 24 pockets in which to place them. Each day a new character is added to the stable scene above – with the added bonus of a Terry’s Chocolate Orange Segment in the pocket too. Simple concept, but I spent a not inconsiderable length of time pondering how it was going to work. I was puzzled and consulted Twitter. Not one but three friends responded with the glaringly obvious information that three had crowns and one didn’t. *Blushes* Anyway, the calendar is done, the Norwegians are excited, and it turns out Popping Candy Segments are rather fabulous. 2. The Swingle Singers Yule Songs EP. Released, appropriately, on Advent Sunday, it includes a beautiful version of O Come, O Come Emmanuel which also has an interesting video accompaniment. Plus, there’s the utterly gorgeous arrangement of O Holy Night that captivated me when I heard it live last Christmas and some new compositions. An appropriate addition to anyone’s Christmas playlist. Last week I mentioned that I didn’t have an Advent Calendar…that lasted a day – mysteriously Waitrose had the one I was after (Divine – fairly traded chocolate & with a religious image, thus meeting the age-old criteria of Advent calendars) on December 2nd, but not on December 1st. It’s become a community advent calendar as I’m keeping it at the office and bestowing chocolate and biblical verses upon my colleagues. They seem to appreciate it. C was very excited when on Thursday I emailed him from my sofa to say he could open it as I was working from home that day. I was challenged by reading Jo’s advent post last week, in which she said that they were giving up tv for the season. I wasn’t intending on going that far, but it did make me reflect on the fact that I’ve hardly read any books lately. Usually I have a voracious appetite for all sorts of books, but since the summer I’ve barely read anything. I work in our church bookshop once a month and the main perk is getting a discount on purchases. As a result, I usually buy at least one new Christian book a month and group them in an attractive pile on my bedside table, where they gather dust. 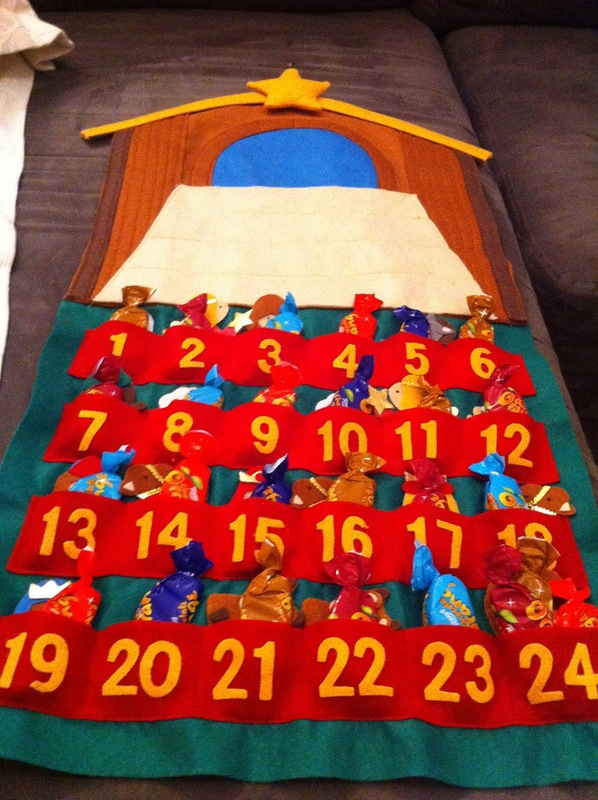 My aim is to continue my mission past advent and into the new year so I can clear the pile before I acquire any more. Today’s December 1st and for the first time in my life I have no advent calendar. But I’m going to get over it and remember that actually, I don’t need little windows to help me remember the season. I probably should do something else to prepare for Christmas, but so far I’ve not thought of anything. In the space of a month I’ve gone from having an out of the ark, decrepit piece of junk as a work computer to a machine that is probably is the most sophisticated in the building. My lovely (though not purple) laptop is just a tad confusing, what with Office 2007…nevermind. Now I’ve just got to decide where to take it for its first outing. Oh and of course I didn’t manage to not blog today! I didn’t especially want to – but you know, sometimes the creative juices just can’t be stopped…ahem.